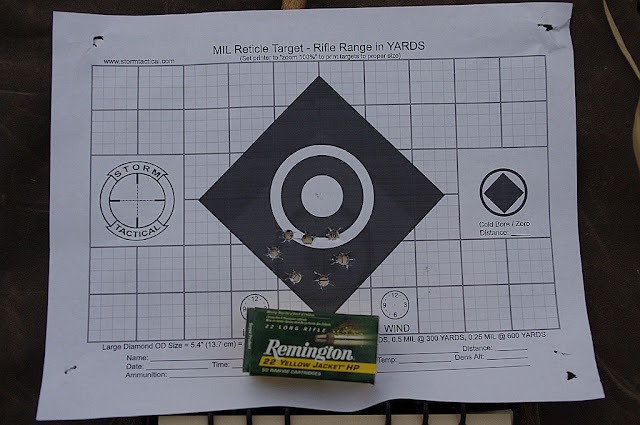 In the second round of ammunition testing I wanted to do a better accuracy test, a slow fire squeeze 'em off just to see if there was any big differences. I also wanted to document as much data as I could on each type. Just because it's a lowly .22 does not mean one can't learn from it. I'm a fan of documenting my shooting, it's another facet of it that is not only rewarding in the simple methodology but can also teach me things. To that end I have a data book for each of my rifles. 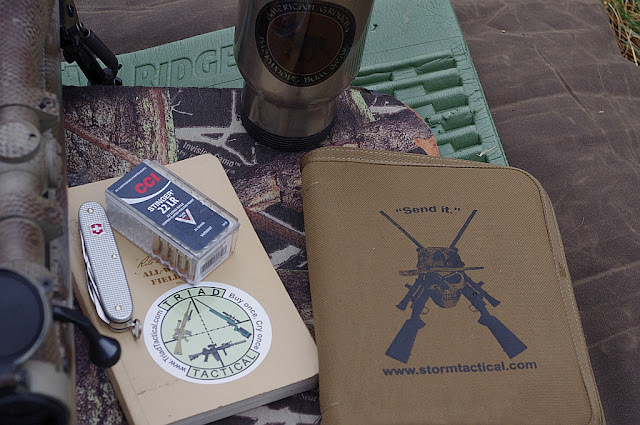 Storm Tactical in this case, though I also use other versions. 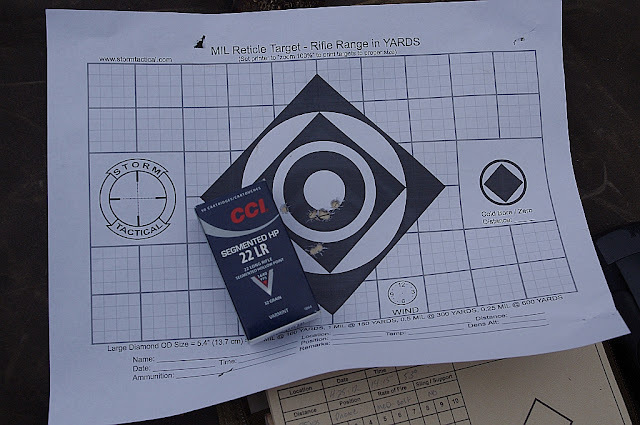 A book allows you to learn the ins and outs of a rifle, makes range time more productive and over time you accumulate information that will make you a better shooter. 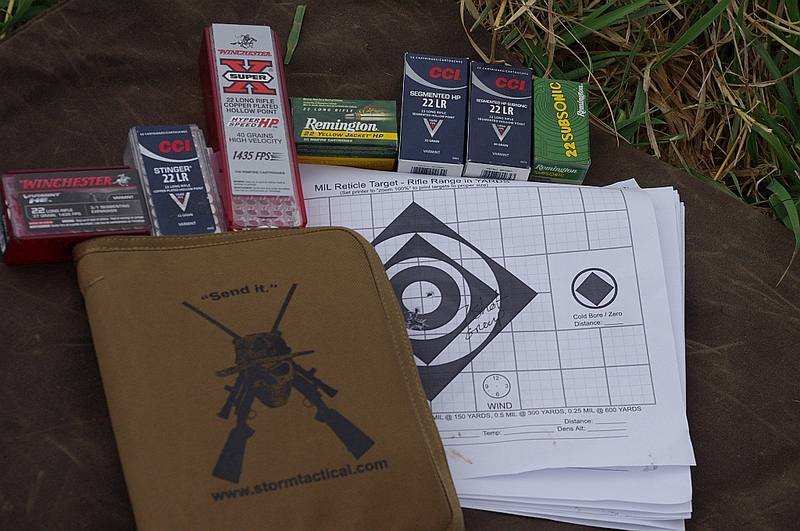 Storm Tactical also offers down loads of multiple different types of targets, many of which are for use with their data books. Great combination. I'm a bag man, I admit it. 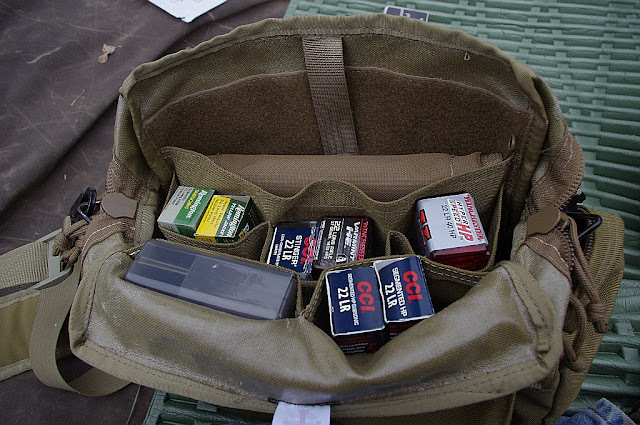 Over the years I've accumulated closets full of bags, in this range excursion I used my TIB from One Source Tactical to carry ammo, mags, data book and assorted other sundries. OST is a great group of people to deal with, over the years I've never had a so much as a hick up with their service or products. 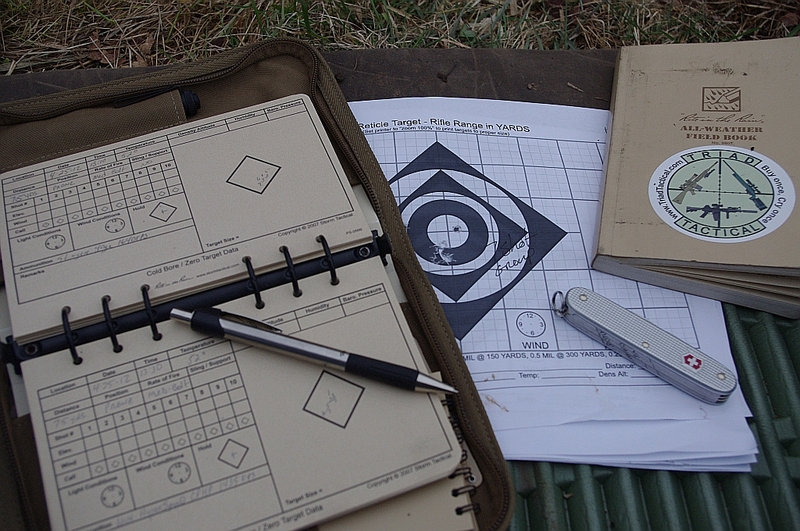 Couple of images from the range, above the scope and through it. Shooting was done from 75 yards, prone using a bi-pod. Scope is a Leupold Vari-X II 3x9x49. The camera was a little far back from the scope and doesn't show an accurate portrayal of the image normally seen by the eye. It was cloudy and damp, wind was nominal out of the west at about 3 to 5 miles per hour, 48 degrees. I started with CCI Stinger 40grs and an advertised muzzle velocity of 1640fps. There was one flyer in the group, the rest were pretty much dead on, tearing a single ragged hole. 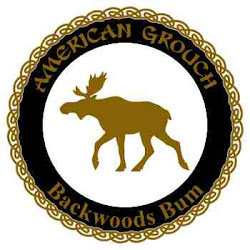 All groups were seven rounds each. 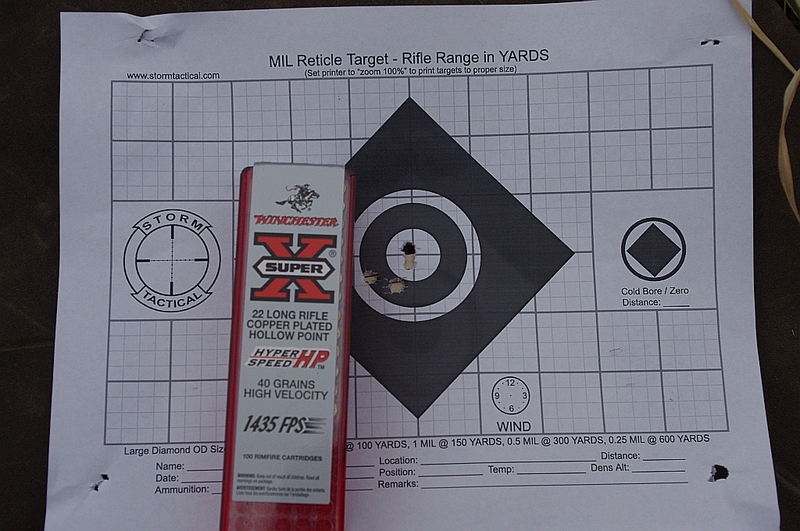 Next up was Winchesters Hyper Speed Hollow Points, 40grs at a stated muzzle velocity of 1435fps. This was a seven round group as well. 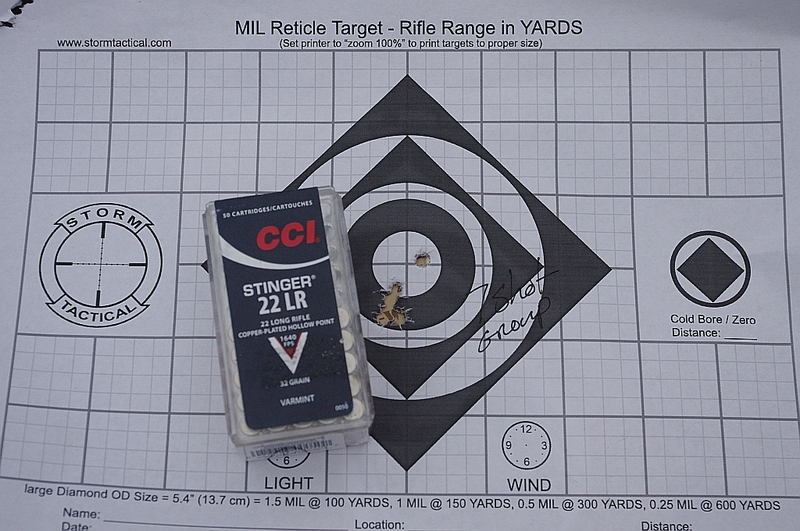 Remington Yellow Jacket, 33grs and a stated velocity of 1500fps. I had hoped for better out of this round, I've been shooting it in .22s since I was a boy, this Marlin 925 however, does not like this round. Worst group of all the test ammo. Winchester Varmint HE, 37gr segmented round with a stated velocity of 1435fps. The segmented bullets from both Winchester and CCI are basically 3 segments designed to separate on entry, creating 3 exit wounds. In the limited testing I've done so far this is bearing out, the rounds are absolutely devastating and create large exits. Not the round to use if you're looking to maximize meat take and or preserve the pelt. It's going to leave major damage on both counts. More on this in phase III of the testing. Four of the rounds were nearly same hole, 3 flyers, could have been me though. CCI Segmented 32grs, muzzle velocity 1640fps. Not the tightest group but not bad either. 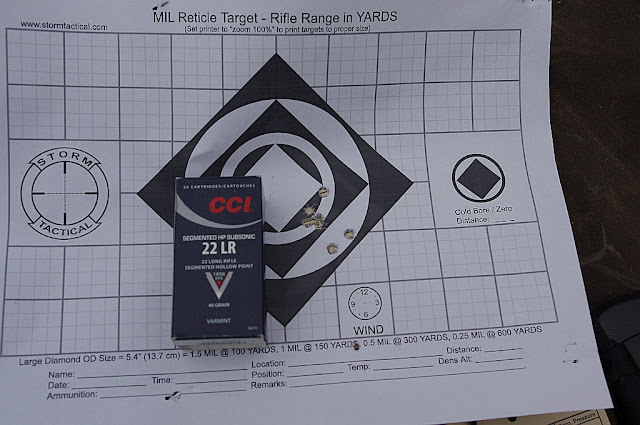 This is basically the same thing as the Winchester Varmint HE, CCI claims theirs is roughly 200fps faster. I have my doubts though without a chronograph I can't confirm. I know I held in the same spot, I would have expected another 200fps to have resulted in impacts higher than the Winchester round, this did not happen, even though the Winchester rounds are heavier by 5grs. 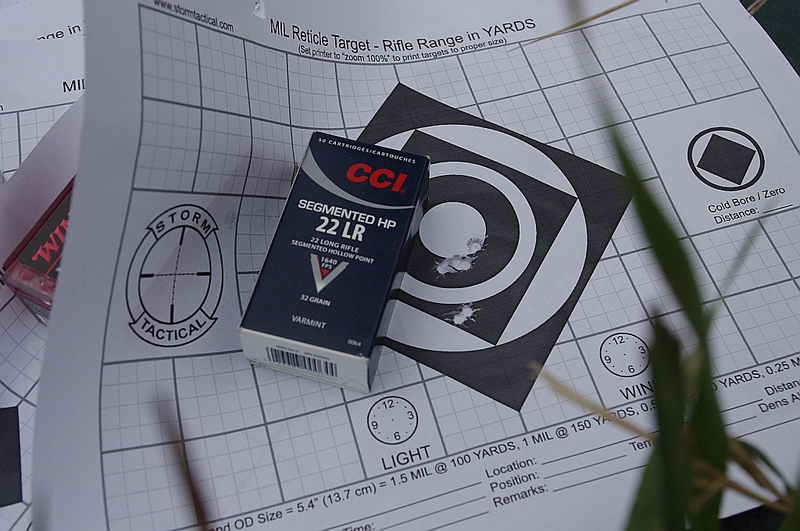 CCI Segmented 40gr Subsonic. 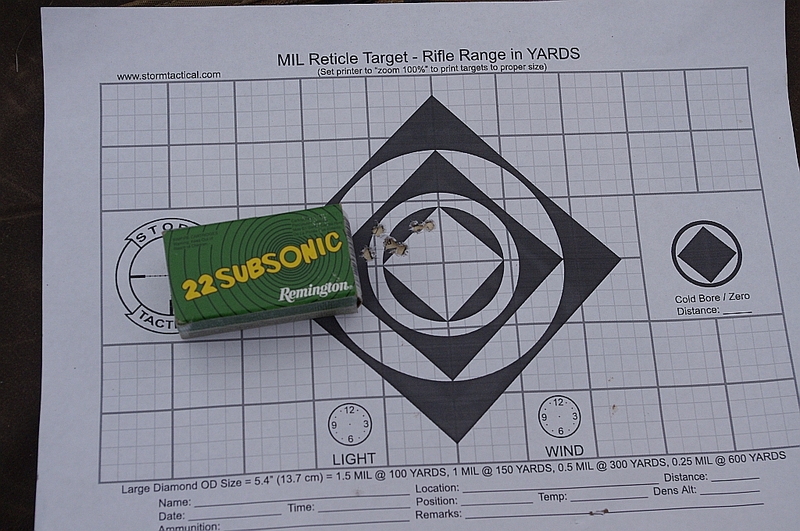 I really like subsonic ammunition, much quieter, so much so I can hear the bullet impact the target. 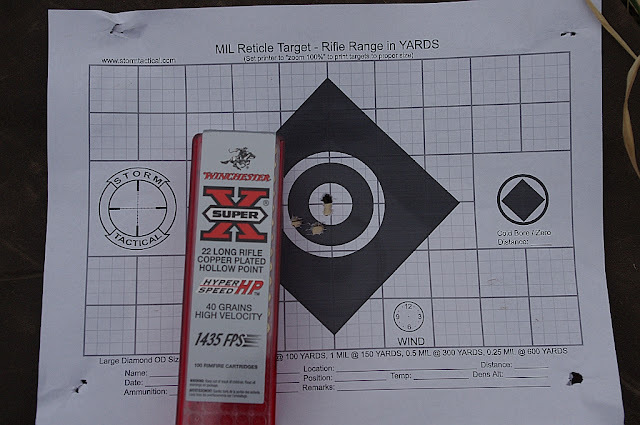 It's much slower than all the other ammunition tests with a stated muzzle velocity at 1050fps. Knowing this in advance I held on the top black triangle of the main diamond. This resulted in impacts to the target between 3.5 and 3.75 inches below the point of aim. The group wasn't bad over all, three flyers. The only other subsonic ammunition in my test is the Remington Subsonic, 38grs and a stated muzzle velocity of 1050fps. Normally I shoot fairly good groups with this ammunition, today's groups as a bit wide left to right. In this case I held about 3.5 inches above where you see the impacts, same as the CCI Subsonics. So far I've only found one dog of the bunch, the Remington Yellow Jackets are now out of the running. Similarly the Federals from phase one are no longer in the running either. Second set of accuracy testing for Remington Viper, CCI SGB, Winchester Power Point, and a few others will wrap up soon. More to come! Gotta love .22 Caliber ammo. Fun and cheap to shoot. Man do i Love to read topics that are Pro- 22, and not against. 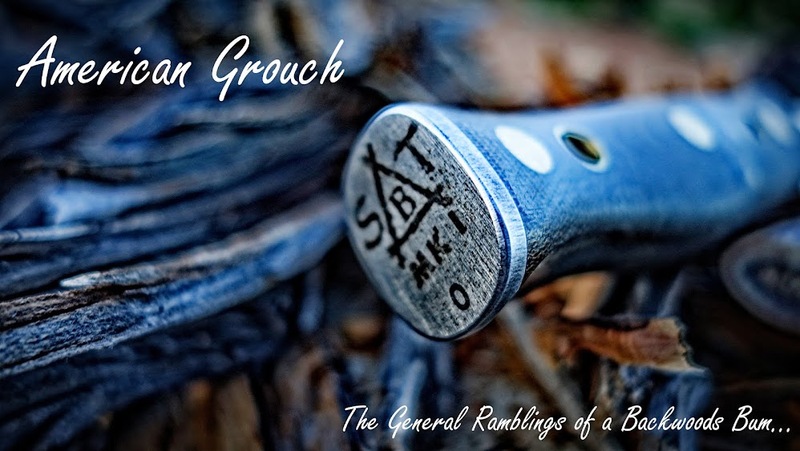 I use 22Lr as well as 22 WMR and they are pretty damn good stuff, especially the WMR, which is smallest possible, legal caliber to use for any small game, including grouse and goose. Same here, I think I've been afflicted with the .22LR bug, again! Hey, i saw you noticed my super-high end ammo holder :). Glad you found it somewhat useful. Those stingers...pretty good stuff but they have pretty shredding noise as well. So you guys there dont have so tight rules, of bullets energy, restricting what you can hunt with 22 cal? 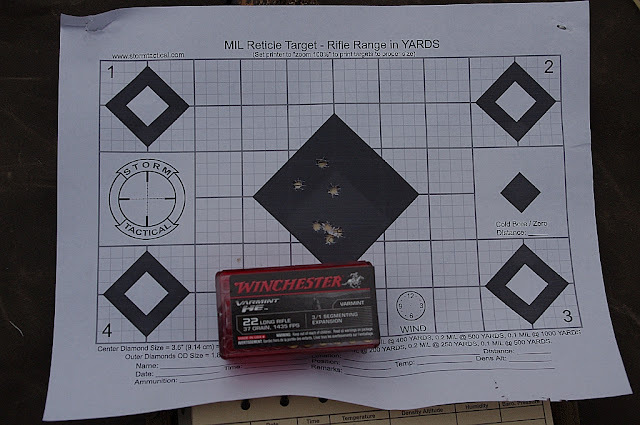 We have, so only few types of ammo, is legal for small game, and thats maye one of the reasons why i use also 22wmr and 50grain ammo, as it has bit more power and i can get bit heavier ammo for it, so there will not be any argue with hunting officials. It varies by state, some allow .22lr for certain things and others not so much. Most of the type it is broken down by the size of the critter being taken. In Minnesota for example, deer require a .220 caliber or larger, but for small game .22lr is fine. I've never used a .22lr on deer sized game, but more than a few coyotes, racoons, etc have been taken with it, along with a plethora of smaller game like squirrels and rabbits. Also used quite a bit on the trap line to quickly dispatch catches. Here lately I've been using my bolt version to practice shooting mechanics. 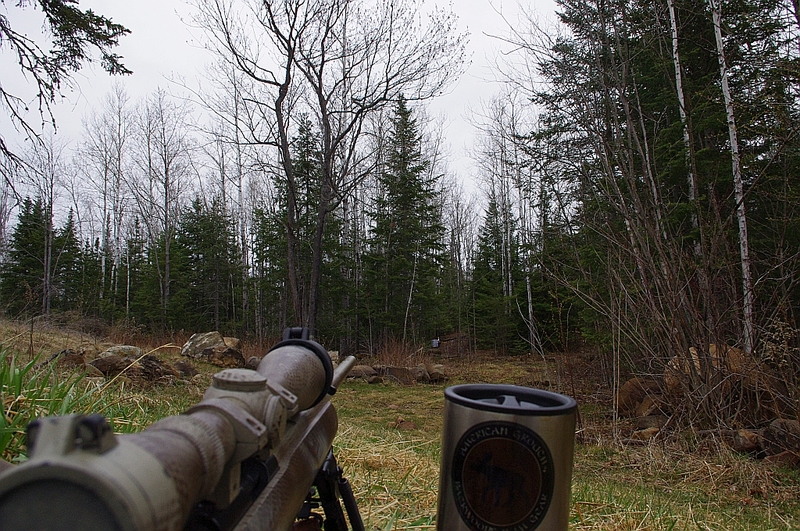 I've got the long range shooting bug, using a 7mm Remington Magnum for that, Weatherby action in a custom stock. Shooting mechanics are the same regardless of caliber. So that's what's got me on this kick. Should be able to get a piece up on that 7mm Mag in the near future. And yes, I did find your old bit holder idea as a round carrier for .22 an ingenious idea. Went down to the garage right after reading that to dig some of my old ones out.